Keeping your processor cool is something everyone worries about today. Especially people with higher end T-Birds, those boys run hot as hell. 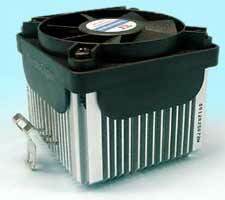 And of course, to meet our needs, there has been no shortage of performance coolers in the marketplace. It seems there's a hundred new and improved heat sinks out there trying to be the best. (At last count, I'm not exaggerating.) However, most of these heat sinks wouldn't fall under the description of performance, and many of the ones that do are not in the category of cheap. 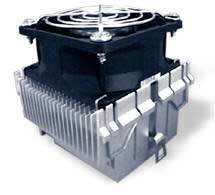 Then in steps Vantec with a new heat sink, the FCE-62540D. What's interesting about this is the fact it's designed to be a pocket friendly performance heat sink. 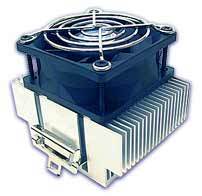 The Vantec goes for about 20$ at a lot of online shops, where as the present heat sink king, the Thermoengine, goes for about 35-40$ roughly with the delta fan installed. This makes the Vantec look extremely alluring due to the much lower price point. Before we get into testing, lets take a quick look at theories behind processor cooling. Brute force: This is a simple method of cooling, and has been done quite a bit. Take a hefty block of aluminum, make it have a lot of surface area and slap it onto a processor with a big fan on the top of it. Alpha heat sinks would usually fall into this category, as would many other manufacturers as well. They can be great heat sinks, but sometimes they can be a bit of an eyesore, as they tend to be very large. Better Metals: This is something we're seeing more of now. This trend uses metals other than aluminum for parts of the heat sink, metals such as copper and silver. Aluminum is a great metal for heat sinks, as it is reasonably low density making it light for the size, and it has a great heat conduction and convection ratio. This is why you see it used so much, not to mention the fact aluminum is cheap. Copper is one you're seeing more of now in coolers such as the Hedgehog and the Global Win CAK-38. Coppers coming into play now because its one of the few metals with better heat properties than aluminum and is still a reasonable cost. The last one you might see is silver. I say, "might see" as it is still far from common, as the only heat sink I know of thus far that employs it is the Noise Control Silverado. It's not used more, despite its excellent thermal properties, due to the much higher cost of the metal, making products seem extremely expensive. Tech Cooling: This category is not quite as easy to define as the other two as it can come in many shapes, sizes and designs. The tech coolers usually try something different than we've seen before to amaze people at how well they work. Some prime examples of this would be the Thermaltake Orb line of coolers, and the Agilent Articooler. These were some seemingly crazy designs for coolers when they hit, but the exceptional performance made them take off. The tech coolers can be some of the most interesting heat sinks to look at, as they're generally something different for design. Combination Coolers: These are the hardest to identify, as they can literally be anything. One good example would be the Super Orb. It took the tech cooling of the original golden orb and applied the brute force method to it when they doubled its height and added a second fan. Some of Alpha's heat sinks also can go under here, as they tried to combine brute force with better metals, when they started putting copper bases on their heat sinks. Now that the stage is set, lets get down to some actual tests on this thing. Here's the test, to find out how the Vantec cooler holds up against some other coolers out there. Here are the entrants into the test facilities. Why those 3 coolers? Well, for one, I've got them here, so that's a bonus. But aside from that, they're also 2 of the more popular coolers around. The Thermoengine is popular because it's been the best cooler available for a while, and then the FOP-32 is popular because it's reasonably quiet and a solid cooler to boot. When I got the Vantec cooler my first impression was "it's the FOP-32 again", which it REALLY does resemble extremely closely. Only the Vantec is a LOT heftier in both dimensions and mass. This should help it out in cooling, but the numbers coming up shall show there. When I got around to testing these heat sinks, It was an EXTREMELY hot day in town, and since we hadn't been running the air conditioner in the house for some reason, it was extremely hot inside the room. (Over 26C to be somewhat precise, and for those of you who dislike the metric system, that translates to a room temp of 82F or so.) The higher temps meant that the system would have readings that were that much higher, and meaning that the heat sinks would be tested that much harder. All Heat sinks were tested with Arctic Silver 1 on them and the core, and the CPU was cleaned thoroughly between tests. Some more stuff not really that critical to the CPU testing areas. Thermoengine: It is a toughie to install, as has been stated by many people. A screwdriver is necessary to aid installation and un-installs as well. Care must be taken, as this is a HEAVY Cooler, and with the design, could damage a Tbirds core. Vantec: Was the easiest to install, and went on without too much work. The cooler was notably lighter than the Thermoengine, but a fair bit heavier than the FOP32. If any care is taken during installs, I don't see this cooler hurting too may Tbird cores. FOP-32: Well, most people are familiar with the Global Win clip of infamy. It's not the greatest. But I used it for 6 months straight, so I have gotten used to attaching it. It was by far the lightest of the bunch, and was not that much of a risk to use. IDLE: install the heat sink, let windows boot and let it sit till temps stabilize. Motherboard: Temp was taken from motherboard monitor, and it was taken at the same time as the CPU temp was. Room: Taken with a standalone temp monitor, from about 5' from the tower. Used to make sure ambient temps didn't change that much during the tests. Well, as I Was expecting, the Thermoengine still won the test against the Vantec. So the Thermoengine is the better cooler than the Vantec, but it didn't surpass it by that much. The Vantec was awfully close at only 1C off. However, this does NOT come without some caveats. The Vantec cooler is going for around $20 from many locations online, and that's with the delta black label fan, whereas the Thermoengine is going for closer to 30$ with their stock 16 cfm fan. It comes in at more like $35-$40 with a delta fan installed on it. Making a much more expensive solution for cooling. As for the installs, I found the Vantec to be a much more workable unit, and went on easier (and much easier to take off later) than the Thermoengine was, not to mention the clip was easier to work with by hand. The FOP was more cumbersome to work with than the others, due to clip design, but was a softer feel to it. One last thing with any performance heat sink is noise concerns. Since both of these better coolers use the Delta fan on them, well, they sound a lot like a hair dryer in your case. They work VERY well, but they're loud as hell by any standards. The FOP-32 is the only cooler I used that didn't have the delta on it; it came with a YS Tech 26 cfm fan onboard. While not that quiet a fan, it would seem to be silent when you're used to a delta sitting next to you. I had forgotten what a quiet case was, as I had gotten used to the loud whirr of the delta next to me, as soon as I popped the FOP back into my case I wondered if it was working, because it wasn't deafening me. Well, there's no clear-cut winner. All out power: Thermoengine. It had the best temps of all the heat sinks. Best Bargain: Vantec. It costs about half of what the Thermoengine costs, and its really close in performance. Installation: Vantec. The clip was a lot easier to use than the other two, and the large flat base made installation easier than the Thermoengine. Noise: Well, the FOP had this from the beginning. It is SO much quieter than the other two contestants. It doesn't even play fair, It probably cheats. Value: Vantec. Its about the same pricing level as the FOP-32, and half of what the Thermoengine runs. Then it performs almost as well as the Thermoengine. It is definitely the winner here.